Top : Technical Resources : Schools : University of Newcastle upon Tyne UK. Department of Marine Technology. B.Eng., M.Eng., M.Sc., M.Res., Ph.D. and beyond in marine technology, offshore engineering, marine engineering, naval architecture, small craft, including all aspects of design, construction, production, operation, decommissioning and demolition of all types of ships, marine craft and structures. 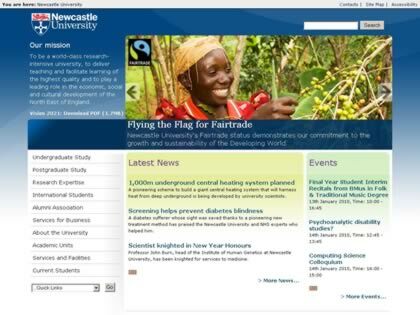 Web Site Snapshot: If available, above is a snapshot of the University of Newcastle upon Tyne UK. web site at http://www.ncl.ac.uk/ as it appeared when this site was added to the directory or last verified. Please Note that Boat Design Net has no involvement with the above web site; all content and images depicted in the above thumbnail are the property and copyright of University of Newcastle upon Tyne UK. unless otherwise noted on that site. Description: Department of Marine Technology. B.Eng., M.Eng., M.Sc., M.Res., Ph.D. and beyond in marine technology, offshore engineering, marine engineering, naval architecture, small craft, including all aspects of design, construction, production, operation, decommissioning and demolition of all types of ships, marine craft and structures. Visit University of Newcastle upon Tyne UK.